Not all weddings we do are local, and not all weddings we do are “sunshiny and warm” in fact we traveled just over a hour and half to be with Brian & Hannah today and it also wasn’t the best of weather either… in fact I remember it was kind of cold, windy, and if I remember correctly rainy… But oh no that didn’t stop us from having a good time. 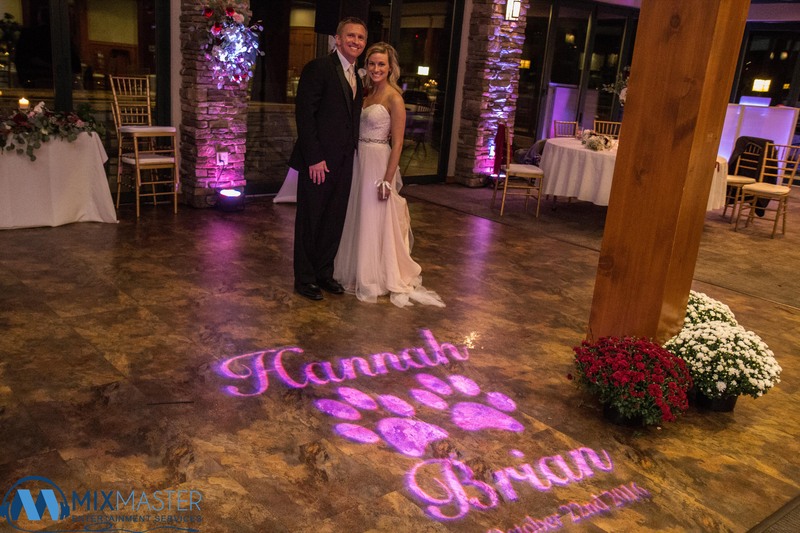 Brian & Hannah ended up having their wedding ceremony right inside the ballroom where their reception would take place as the weather didn’t want to cooperate with us. This goes to show you that you should ALWAYS have a backup plan and this is exactly what we ended up using, but it turned out to be BEAUTIFUL. 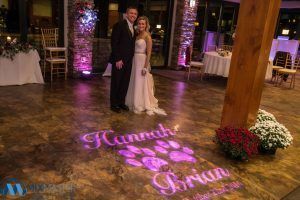 After the wedding ceremony we plugged in our purple uplighting, and customized monogram that Hannah requested we use “dog prints” to represent their dogs. (come on they are family too… just furry) A lot of close family and friends came to celebrate and dance the night away with this awesome couple. For the uplighting we also even “uplit” the cake or should I said pin-spotted it to make it really stand out. We can do this for just about any wedding. It added warmth to what was a beautiful day for this couple. Check out some photos and video below.